Plantronics Blackwire C725-SFB/Lync Binaural Headset Active NC is an audio communication device that provides users with access to active noise cancelling technology and hi-fi stereo performance, which improves productivity through better and crystal clear conversations. The device is capable of tuning the noise in and out in order to know when to dwell more on work and when users can talk to other people in the office, making it perfect for noise workspaces. 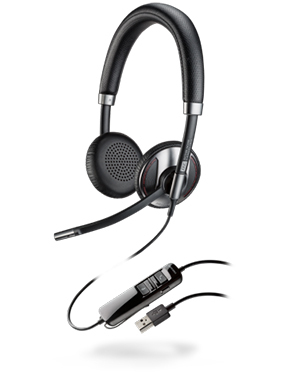 Plantronics Blackwire C725-SFB/Lync Binaural Headset Active NC offers users the comfort needed for an all-day usage. It has a comfortable and padded headband that is fitted to the head. Its Active Noise Cancelling technology helps in cancelling low frequency noises by reversing surrounding sound waves. Plantronics Blackwire C725-SFB/Lync Binaural Headset Active NC is a device that serves as an investment through the technologies integrated in the device. The combination of all the technologies and systems help in users’ operations. Have this product delivered to you when you need it by calling our company hotline at Australia wide 1300 131 133! Plantronics is an American enterprise that operates as one of the best developers and manufacturers of audio and sound products and solutions in the market. The company is supported by approximately 5,000 employed workers and guided by the leadership of President and CEO Joe Burton. Headquartered today in Santa Cruz, California, it has provided the market with high quality audio products and innovative sound solutions that a lot of customers benefit from today. Plantronics takes pride in being the instrument of one of the largest events in the history of mankind, which is the first time a human being ever set foot on the moon. From this endeavour, it has become the epitome of excellence in audio and sound. Headsetsonline operates transactions through its secured official site at Headsetsonline.com.au. This site is enterprise-encrypted, using the same encryptions and security logins as banks, which is comprised of the 2048-bit root encryption and 256-bit identity authentication. For additional protection, the site also has green URL address bar HTTPS and Geo Trust True Business ID with Extended Validation. Headsetsonline Pty Ltd is, in fact, a popular online store that has become the one-stop-shop for customers searching for the most ideal and effective audio and sound products and solutions in the Australian market. In fact, the company specialises in supplying and wholesaling the market with high quality headsets, headphones, and speakerphones. With history operating as a division under a well-known company that has been delivering to the audio needs of corporate sectors and government agencies since the year 1998, Headsetsonline has proven its expertise repeatedly not only through decades of experience but by showing how well it knows customer needs and the market in general. Have this product delivered to you when you need it by calling our companty hotline at Australia wide 1300 131 133!